She said yes at the break in FA Cup fourth round replay. 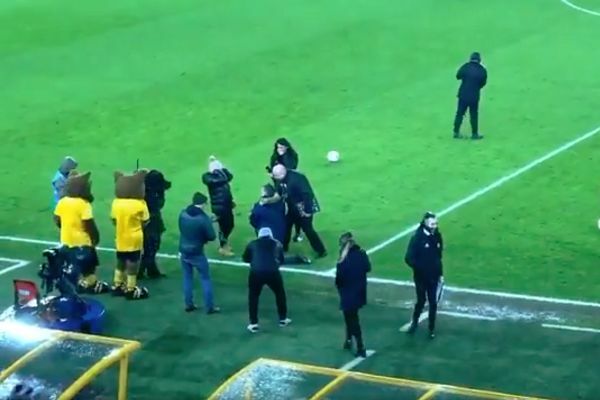 A couple got engaged on the pitch during half-time of Wolves’ FA Cup fourth round replay against Shrewsbury Town at Molineux on Tuesday night. The stadium announcer narrated for the crowd as a fan got down on one knee and proposed to his, hopefully likeminded, partner at the break. Chants of “you don’t know what you’re doing” could reportedly be heard from the stands of the Premier League ground. But, to great fanfare, it’s revealed that she said yes and the engagement is sealed with a hug. It was a great evening for the newly-engaged supporters but things didn’t end well for League One Shrewsbury. Wolves came back from 1-2 down to win 3-2 and progress to the next round at their expense.